From the dawn of history Asia had dominated the world trade and the global space due to its rich heritage, mature civilizations and its socio-cultural values. However, internal fissures and struggles, lack of strategic vision and a certain level of complacency led to the stagnation of innovation. They were thus left behind in the revolutions in economic and military affairs leading to their colonisation, economic depredation and penury. However, post-independence the robust economic rise of Asian economies since the late 1970s – the opening up of China, under Deng Xiaoping, to US to garner economic support in the late 1970s, the Japanese economic juggernaut, the rise of the Asian Tigers and the opening up of India’s economy in the 1980s and 90s led to the concept of ‘The Asian Century’ in the 21st Century. the gradual shift in the maritime trade centre of gravity to the Indo-Pacific Region symbolises this view despite scepticism in the West. This paper analyses the concept of the Asian Century, the challenges that impede its actualisation and the options to achieve the same. It provides a broad outline for the way ahead based on the need for the rising / emerging / developed nations of Asia to come together, shed their historical and colonial baggage and contribute for the larger good of Asia, rather than limit their vision to their own growth at the expense of the rest. It provides a good conceptual framework for achieving the Asian century in a phased manner by establishing an Indo – Pacific Regional Commission centred amongst the nations of South (less Pakistan), South East and East Asia. The expansion to encompass other nations for achieving an Asian Union (akin to EU) would occur post stabilisation of this commission and based of the geo-political and geo-strategic dynamics in their regions. From the dawn of history Asia had dominated the world trade and the global space due to its rich heritage, mature civilizations and its socio-cultural values. Endowed with fertile and large agricultural tracts, a rich tradition of farming, jewellery, pottery, metallurgy and cloth weaving, Asia controlled much of world trade till the 1st Industrial Revolution (Age of Steam Engines and Mechanical Production) around the mid-18th Century centred in Europe. By then the process of colonisation of Asia was underway, as such it was not only left behind in this economic revolution but also in the preceding revolution in military affairs (RMA), in the 15th -16th Centuries – brought about by the use of gun powder in firearms, cannons, armed ship armadas and in the force structures to effectively prosecute their usage. By the time of the 2nd Industrial Revolution (Age of Science & Mass Production) in early 20th Century much of Asia was colonised and well on its way to penury, having being drained economically by its colonial masters. Mid-20th Century witnessed the independence of these colonised states post the Second World War even as the 3rd Industrial Revolution (The Digital Age) started gaining ground. Yet challenges abound with internal, sub-regional, regional and external fault lines and fissures amongst nations – a legacy of the colonial past and historical baggage. Coupled with this are the economic, political, socio-religious fissures and the infrastructure and energy voids that appear to restrict and restrain the rise of Asia. These fissures, if not pragmatically resolved or mitigated, could see the descent of Asia into conflict and instability thereby inhibiting its rise. With the USA and Europe in an economic and strategic flux, Asia has a unique opportunity to achieve the Asian Century. For this the rising, emerging and developed nations of Asia, viz., China, Japan, India, South Korea, Thailand, Malaysia, Indonesia and Singapore (to name a few), need to come together, shed their historical and colonial baggage and contribute for the larger good of Asia, rather than limit their vision to their own growth at the expense of the rest. This paper analyses the concept of the Asian Century, the challenges that impede its actualisation and the options to achieve the same. 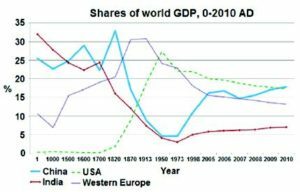 Asia was the leading economic power in the world stage till 17th – 18th Century. Endowed with large tracts of fertile land, temperate climate in most parts (especially South, East and South East Asia), a rich heritage in farming, pottery, jewellery, metallurgy and cloth weaving, it controlled much of world trade. For millennia Asian landmass was witness to mature civilisations, rich heritage and socio-cultural values. However, internal fissures and struggles, lack of strategic vision and a certain level of complacency led to the stagnation of innovation. They were thus left behind in the revolutions in economic and military affairs. The effective use of gun powder in war fighting by the West in firearms, cannons and armed ship armadas, signalled a gradual shift to the 2nd Generation Warfare. The armies of the east were found wanting when facing up to the West due to this vast technological asymmetry, leading to their gradual defeat and colonisation. The 1st Industrial Revolution that saw a transition from hand production to mechanical means of production was centred in the West and bypassed Asia. Concurrently, the decline of the Silk Route due to the fragmentation of the vast Mongol Empire and internecine fighting between the various Khanates led to the West searching for a maritime trade route, especially to India. The initial footprint in Asia, by the West, was as traders, which gradually metamorphosed into them becoming the rulers of various nations that they effectively colonised. With captive market for their industries, the hold on the resources needed for their industries from these regions and the slow strangulation of local industries, the economic decline of Asia commenced. Figure 1 shows the decline of the major economic contributors to World trade till colonisation, viz., India and China2. The revival of Asia began with the rise of Japan, South Korea and Taiwan through major economic assistance from the US, being significant frontline states and allies in the East during the Cold War, as a bulwark against the spread of communism. This aspect was something similar to the US assistance and support in the reconstruction of Western Europe. The opening up of China, under Deng Xiaoping, to US to garner similar support in the late 1970s, even as the Japanese economy was being viewed as a juggernaut, led to its economic rise. The 1980s and 1990s saw the rise of the Asian Tigers and the opening up of India’s economy that led to the concept of ‘The Asian Century’ in the 21st Century, considering the gradual shift in the maritime trade centre of gravity to the Indo-Pacific Region. The robust performance of the Asian economy, as compared to the rest of the world, in the early 21st Century does seem to underline that Asia is on the cusp of transformation in its march towards prosperity. It needs the rising, emerging and developed nations of Asia, viz., China, India, Japan, South Korea, Thailand, Malaysia, Indonesia and Singapore, to step forward for the larger good for Asia. Of the US$ 74 Tn world GDP, while US constitutes a quarter of it, these eight emerging / rising / developed nations of Asia together contribute nearly 28 per cent 3 (Refer Figure 2 below). Similarly, if the foreign reserves are considered, these eight nations of Asia together possess over US$ 20 Tn4 as compared to over 12 Tn held by USA. These nations could be the engines for the transformation of Asia. The ADB report on Asia 2050: Realising the Asian Dream, published on 31 March 2011 states, ‘Asia is in the middle of a historic transformation. If it continues to follow its recent trajectory, by 2050 its per capita income could rise six fold in purchasing power parity (PPP) terms to reach Europe’s levels today. It would make some 3 billion additional Asians affluent by current standards. 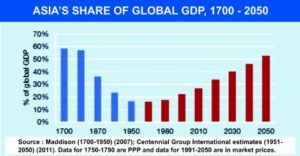 By nearly doubling its share of global gross domestic product (GDP) to 52 per cent by 2050, Asia would regain the dominant economic position it held some 300 years ago, before the industrial revolution’ (refer Figure 3). 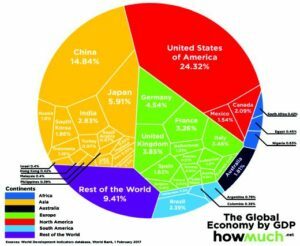 While the timelines of the ADB report may be debated, considering the large voids in infrastructure and energy, institutional and governance issues and the various fissures within and amongst the nations, yet the basic contention that the Asian Century could be achievable seems to hold true. Challenges do abound, but if these are resolved pragmatically, for the larger good of the region, then Asia would become affluent and strong. However, the economics and social cost of missing this opportunity to achieve the Asian Century are staggering as it would render an Asia that is unstable and ridden with conflicts. On 25th September 2015, the UN General Assembly adopted Resolution 70/1 – ‘Transforming Our World: The 2030 Agenda for Sustainable Development’5, since been shortened as the 2030 Agenda6. It consists of 17 broad and interdependent goals (Sustainable Development Goals – SDG), yet each has a separate list of targets to achieve, totalling to 169 targets. While criticisms do abound on capacity to achieve these targets, yet these could form the basis for a new ‘Asian Economic Strategy’ to help the region achieve some semblance of sustainable development and the concomitant prosperity. US$ 800 Bn for Water and Sanitation needs. an acute lack of strategic trust between nations due to the historical baggage and colonial legacies. Water is fast emerging as another major flash point, both within the states and between states. The rising population, issues between the upper and lower riparian states and poor water management coupled with climate change is leading to a severe water crisis, which is a major cause for concern. Many strategists have predicted that the future wars could be Water Wars that would be global in scale. Security, both internal and external, is fast becoming a major destabilisation factor in the region. Use of non-state actors as a state policy, exploiting internal fissures for petty political gains, external support for regime change and internal instability to gain geo-political and geo-strategic space, and the expanding New Great Game to the Indo-Pacific region from West Asia and North Africa, is creating political and economic instability, much to the detriment of Asia’s growth. These challenges are compounded by the fact that there is no single overarching regional umbrella (akin to the EU) to be able to resolve or mitigate these challenges and derive a regional economic and security strategy to facilitate economic and political stability. There are multi-farious regional architectures within Asia that seem to be working at cross-purposes to each other. Concurrently, a rising and revanchist China wants to gain sole leadership of Asia ( first phase of China Dream) – something that is anathema to India and other like-minded democratic countries (Japan, South Korea, Indonesia, Malaysia, Singapore and Thailand), which look towards a multipolar Asia within a multi-polar world. The Belt and Road Initiative (BRI) appears to be China’s economic strategy to achieve its Dream – a debt-trap strategy, to entrap states to gain geo-political and geo-strategic space. However, there is a concerted push back by affected nations against such predatory mercantilism by China, especially after it arm-twisted Sri Lanka to gain control of the Hambantotta port. Coupled with the trade war with USA, these events have forced China to re-evaluate its future regional and global strategy. Western scholars have long opined that there is no such thing as a united Asia as it is not a cohesive entity. They consider the term ‘Asian Century’ as a journalistic hype since there is a distinct lack of unity and commonality within the continent. It should be noted that so too was Europe and it was devastated by internecine wars for centuries. It took two World Wars on the continent and a threat to their democracy from communism that led to cohesion and unity amongst most of its nations, in a step-by-step approach over many decades to establish the European Union (EU). Asia too can unite in a similar manner to face the common threat of economic deprivation, neo-economic colonialism and consequent instability. Cohesion and unity would emerge from the desire to present a common front to effectively counter the threats to sovereignty and neo- economic colonisation. The extant geo-economic and geo-political flux provides a window of opportunity for the rising / emerging / developed nations of Asia to come together and enunciate an overarching regional economic and security strategy that would work towards fructifying the Asian Century in a phased manner. These eight rising / emerging / developed nations need to arrive at ways to achieve a new modus vivendi entailing consensus, cooperation and building strategic trust. The need is to move away from ‘compete & contest’ towards an entente cordiale leading to greater harmony and cooperation within the region. Considering that there is marked instability in the West Asia and a degree of uncertainty over Central Asia, the first focus for achieving a Regional Multilateral Economic and Security Architecture (subsuming requisite extant architectures) could limit its scope to South (less Pakistan), South East and East Asia – an Indo-Pacific Regional Forum. Apart for the historical baggage and colonial legacies, countries do have convergences and divergences based on respective national interests. These exist within the regional and global perspectives. 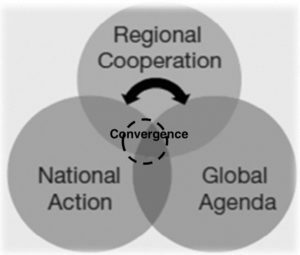 However, with the globalisation and economic interdependence, there would be convergences and divergences even on internal policies of nations, as it impacts the other(s) economically (refer Figure 4 below). The need is to build on the convergences at the regional level to expand the scope for cooperation at the global level. This would serve to mitigate the divergences and strengthen regional multilateralism thereby facilitating the development of the region. It would need a ‘phased adaptive’ approach to achieve an overarching Asian Economic and Security Architecture. The first step would be to establish an Indo – Pacific Regional Commission (IPRC) with like-minded countries, which should provide a geo-political, geo-economic and geo-commerce model that would facilitate economic activities, security, trade, intelligence exchanges, military capacity building, technology sharing and possible agenda setting for some coordinated diplomatic initiatives. It would be a truly ‘win – win’ situation for all member countries of the region. the basis should not be just for countering any country’s rise but for stability and prosperity, only then would it be self-sustaining and long lasting. It would lead to cohesion within Asia, act as succour to the smaller nations and ensure that rule of international law, good governance, equality, transparency and economic prosperity for all is ensured within the region. It could then undergo metamorphosis from a Regional Commission into an Asian Union – a structure that would be able to ensure the actualisation of the Asian Century. Such an organisation would be able to ensure stability, peace and prosperity within the region. Speaking at the SCO Summit at Qingdao in June 2018, PM Narender Modi had not only sought increased economic links and integration among the Shanghai Cooperation Organisation (SCO) security bloc but also underlined the need for respect for sovereignty and transparency in connectivity projects among the members of the grouping. He further outlined his vision for a “secure” region with six pillars, where he said “S” stood for security for citizens, “E” for economic development, “C” for connectivity in the region, “U” for unity, “R” for respect of sovereignty and integrity and “E” for environment protection8. M – Multilateral Regional Economic and Security Architecture – IPRC. Scenario – III. A Divided Indo-Pacific. Scenari – I: A United Indo-Pacific. While ideally this is the best case but the elephant in the room impeding such a scenario is China. Having enunciated the China Dream and its desire to topple USA as the leading power of the world, it would need a major recalibration of its strategy, which appears unlikely at the moment. The Belt and Road Initiative (BRI) is part of its strategy to gain sole dominance over Asia, initially, and then the World. It has been enshrined in its constitution in March this year, and is seen as the panacea to achieving national rejuvenation. However, the push back by many nations to renegotiate the economic model for implementing the BRI projects and avoid getting into a debt trap, coupled with the US trade war has caused China to pause and review its strategy. Despite this setback, it appears unlikely that China under Xi Jinping would shelve its grandiose plans in the near to medium term. Concurrently, there would be restrictions faced by the IPRC from the West and USA to ensure retention of markets for their products, for which a modus vivendi would need to be chalked out. Scenario – II: A Bipolar Indo-Pacific. This scenario appears to be more likely at present, wherein most of the other seven like-minded emerging / developed nations coming together to establish the Commission. China would use its revamped BRI strategy to firmly entrench itself in some countries of the region thereby creating a bipolar Indo-Pacific. It would not be an ideal situation, but would be manageable as it would provide the Asian states with an alternate narrative to the BRI model to choose from. There could be a possibility of some modus vivendi between these two blocs to achieve an entente cordiale. It would enable adequate sustainable development of the region, especially of the countries that would opt to be part of the Commission. This could be more acceptable to the USA and the West as it would assist their pivot to the East. Scenario – III: A Divided Indo-Pacific. Should the countries of the region go bilateral and hedge between USA and China; then Indo-Pacific would stay divided. This would result in an environment of compete and contest that would be detrimental to the region as a whole. While the rising / emerging / developed countries would be able to manage some semblance of sustainable growth, the chances of contest evolving into conflict would be just a flashpoint away. Should it occur, Asia will descend into economic and political chaos. Scenario – II appears to be the most achievable and likely development in the present geo-strategic milieu. It would, however need deft balancing of the core interests of not just the individual states, but also of the external powers – especially USA and the EU. Concurrently, there would be a need to balance the interests of China to arrive at the necessary modus vivendi for an entente cordiale, thereby avoiding the contest from descending onto outright conflict. Asia is on the cusp of transformation in the geo-economic, geo-political and geo-strategic spheres on the global stage. The Indo- Pacific Region is witness to a gradual shift in the maritime trade centre of gravity towards it from the Atlantic and the Pacific regions. This has resulted in a major geo-political and geo-strategic flux in these regions, thereby providing Asia with a unique opportunity to achieve the Asian Century. For this the rising, emerging and developed nations of Asia, viz., China, Japan, India, South Korea, Thailand, Malaysia, Indonesia and Singapore (to name a few), need to come together, shed their historical and colonial baggage and contribute for the larger good of Asia, rather than limit their vision to their own growth at the expense of the rest. However, there are challenges due to internal, sub-regional, regional and external fault lines and fissures amongst nations – a legacy of the colonial past and historical baggage. Coupled with this are the economic, political, socio-religious fissures and the infrastructure and energy voids that appear to restrict and restrain the rise of Asia. These challenges can be mitigated or resolved in a step-by-step approach and the eight rising / emerging / developed nations of Asia need to take the lead to show the way. They need to build on the convergences at the regional level to expand the scope for cooperation at the global level. This would serve to mitigate the divergences and strengthen regional multilateralism thereby facilitating the development of the region. The first phase would be to establish an IPRC that act as succour to the smaller nations and ensure that rule of international law, good governance, equality, transparency and economic prosperity for all is ensured within the region. It could then metamorphosis from a Regional Commission into an Asian Union – a structure that would be able to ensure the actualisation of the Asian Century. Such an organisation would be able to ensure stability, peace and prosperity within the region. The extant geo-economic and geo-political flux does provide a window of opportunity to commence the process for achieving the Asian Century in a phased manner by establishing an IPRC. Ideally the scenario of a united Indo-Pacific would be the best for the region. However, it seems more likely that a bipolar Asia could emerge in extant geo-strategic environment, wherein most of the other seven like-minded emerging / developed nations coming together to establish the Commission. While China would use its revamped BRI strategy to firmly entrench itself in some countries of the region. It would not be an ideal situation, but would be manageable as it would provide the Asian states with an alternate narrative to the BRI model to choose from. There could be a possibility of some modus vivendi between these two blocs to achieve an entente cordiale. It would enable adequate sustainable development of the region, especially of the countries that would opt to be part of the Commission. However, the economics and social cost of missing this opportunity to achieve the Asian Century in a phased manner are staggering as it would render an Asia that is unstable and ridden with conflicts. 3 Alex Gray, World’s Ten Biggest Economies 2017, World Economic Forum, 09 Mar 2017, with figures from the World Bank. @Major General Rajiv Narayanan, AVSM, VSM (Retd) is a distinguished Fellow at the USI.